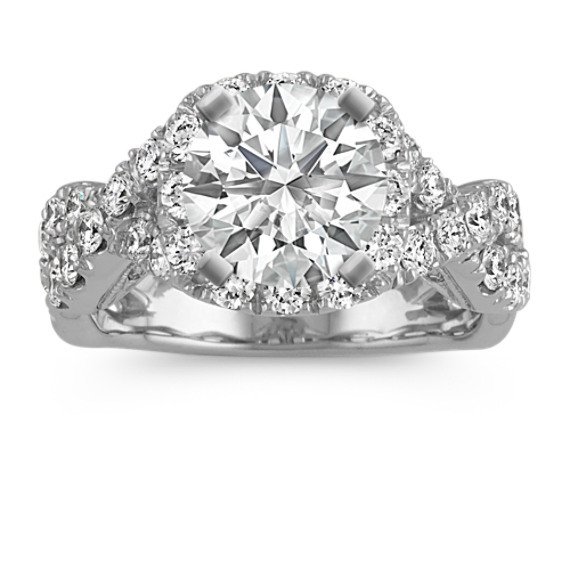 Round Halo Diamond Infinity Engagement Ring | Shane Co. Complete this breathtaking halo engagement ring with the center 1.50 carat diamond of your choice and it will be accented by a total of 70 round diamonds, at approximately 1.35 carats total weight. Each diamond has been hand-selected for exceptional brilliance to beautify the halo and swirling infinity design of the 5.5mm band. Popular diamond choices to complete this ring crafted of quality 14 karat white gold include round, princess cut, and cushion cut. My husband took me to get a new ring for our 11th anniversary. I chose a perfect pink sapphire fit the center stone, and I get so many compliments on it, so beautiful! !